Heirloom seeds are generations-old,non-hybrid varieties, many of which originated in Europe. Handed down from gardener to gardener, they are some of the most unique types available. This comment was from a repeat customer: These tomatoes are the best I've found. If you like a good canning tomato, you can't beat them. They are just so meaty and delicious. I am delighted with my Amish Paste Tomatoes. I think every single seed made a plant. I had to postpone transplanting the young seedlings, and some were quite large with abundant root systems growing through the transplant pots (made of newsprint) but all plants still thrived. 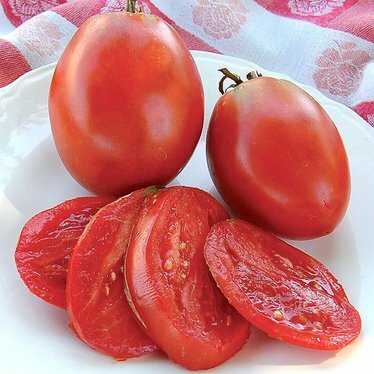 The flavor of the tomato is slightly sweet and delicious for eating fresh. I will be wanting more.